The Eisenhower Matrix is useful for distinguishing which tasks deserve attention and in what order. It helps us by removing perceptual distortion about what matters most. But it can't help as much with some kinds of perceptual distortion. 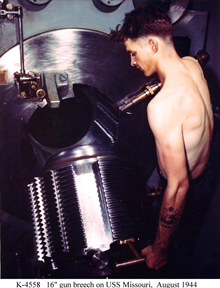 Fire Controlman First Class E.M. Smith, Gun Captain of one of the nine 16-inch main battery guns of the USS Missouri, opens his gun's breech plug, during Missouri's shakedown cruise, August 1944. By 1944, breech loading was the standard design for big naval guns. Indeed, it was the standard design for almost all guns, except mortars, which remain muzzle-loaders to this day. But in 1880, when the Royal Navy adopted them as the standard, breechloaders had just recently taken hold. They had been around since the middle of the 19th century, and many improvements were still to come. The Royal Navy had tried to adopt the breechloader, but up until 1880, the muzzleloader remained their preference. The Royal Navy was actually a late adopter. Certainly a commitment by them would have greatly accelerated the pace of technological development. So it is with many late adopters, especially those who have had substantial success with older technologies. If your organization is having difficulty making a transition, consider studying historical examples of late adoption by successful — even dominant — organizations. Photo courtesy U.S. Navy Naval History and Heritage Command. In the near-chaos of high-pressure workdays, it's easy to err in assigning task priorities. President Eisenhower is said to have summarized the problem this way: "What is important is seldom urgent and what is urgent is seldom important." Using the Eisenhower Matrix, popularized by Steven Covey as the Importance/Urgency Matrix, we can avoid ranking the Urgent but Less Important issues above the More Important and Non-Urgent. In "How to Foresee the Foreseeable: Preferences," Point Lookout for February 22, 2012, I noted another source of priority assignment error, which I called Appeal. This error comes from our tendency to rank as higher in priority those tasks we find appealing. Individuals can make both of these errors, sometimes simultaneously. But things get more complicated when we consider the priority assignment errors of organizations. Here's the beginning of a catalog of causes of priority assignment errors for organizations. Organizations tend to see the world in terms with which they're most familiar. This concept is captured in the idea that armies and nations are best prepared to fight the war they fought most recently, and in the idea that if all you have is a hammer, everything looks like a nail. To assign priorities realistically, approach the situation with a fresh perspective. Include people who haven't been involved in past efforts. See "Bois Sec!," Point Lookout for October 27, 2004, for more. Lock-in occurs in organizations when they escalate commitments to choices of inferior quality, or to courses of action demonstrably less effective than one or more alternatives, based on a belief that their prior commitments have foreclosed alternatives. In this way, they're led to assign priorities based on past decisions, rather than basing them on the current situation. Separate priority assignment decisions from political power. Be ruthless about accepting past errors as errors. See "Indicators of Lock-In: I," Point Lookout for March 23, 2011, for more. Because power is rarely distributed evenly in organizations, the more powerful organizational actors can often use their power to modulate organizational decisions. These political actors can even influence how people assign priorities to the issues of the day, to ensure that the organization chooses a course that enhances, or at least does not threaten, the power they now hold. most familiarvalidity of someone's assertions requires evaluating his or her political positions. Just as power is unevenly distributed, so is political skill. When political skill is used in furtherance of organizational goals, the organization benefits. But political skill can be used for personal advancement, which might actually conflict with organizational advancement. The politically skilled can sometimes modulate organizational decisions in their own favor by influencing priority assignment decisions. Knowing how you (or others) benefit from your (their own) recommendations is essential to maintaining (assessing) objectivity. Would you like to see your comments posted here? rbrendPNZeNZqapsEfkMoner@ChacBmSmUdBojZUbgHVboCanyon.comSend me your comments by email, or by Web form. Sometimes we cancel a project because of budgetary constraints. We reallocate its resources and scatter its people, and we tell ourselves that the project is on hold. But resuming is often riskier, more difficult and more expensive than we hoped. Here are some reasons why. When reality trips up our project plans, we improvise or we replan. When we do, we create new risks and render our old risk plans obsolete. Here are some suggestions for managing risks when we improvise. Scope creep is depressingly familiar. Its anti-partner, spontaneous and stealthy scope contraction, has no accepted name, and is rarely seen. Why? Project risk management strategies are numerous, but these ten strategies are among the most common. Here are the last three of the ten strategies in this little catalog. See also Project Management and Workplace Politics for more related articles. I offer email and telephone coaching at both corporate and individual rates. Contact Rick for details at rbrenkHxaadbnPhrFwJIoner@ChacqFoJsMmLNBMYETLUoCanyon.com or (650) 787-6475, or toll-free in the continental US at (866) 378-5470.